Life in a greenhouse? How ghastly! A greenhouse is for growing plants. It is made of glass or clear plastic to let in lots of sunlight. But why not just put the plants outside? A greenhouse stays warmer than the air outside. Instead of cooling off at night, it traps some of the heat inside to keep the plants warm. Even in the winter, with no heat source but the Sun on a clear day, a greenhouse stays warmer than the air outside. In the summer, if a greenhouse gets too hot, the gardener can open the windows and doors and maybe turn on a fan. A greenhouse is terrific if all you want to do is grow heat-loving plants. But what if Earth's atmosphere started to behave like a too-hot greenhouse? Don't forget, we cannot open Earth's windows or doors to cool it off. Earth as a closed-up greenhouse would soon grow to be ghastly! If you made our Gummy Greenhouse Gas models, you may wonder why the molecules you made with gumdrops are called greenhouse gases. Here is why: If the atmosphere contains too much of these gases, the whole Earth becomes a hotter and hotter greenhouse. The atmosphere holds onto too much of the heat at night instead of letting it escape into space. Then, the next day, the Sun heats Earth's surface even more. If the atmosphere works too well as a greenhouse, each day gets a little warmer and a little warmer. We may not be able to measure this effect from day to day or even year to year. But over tens of years, a few degrees of warming starts causing changes. For example, ice melts in the North and South Pole regions. All this new liquid water raises the sea level. Cities built on coastlines could someday be under water! When the oceans get warmer, weather is affected everywhere. Some places have more severe storms and other places have hardly any rain at all. And many other changes could occur that would be bad for humans and other living things. —we pollute our atmosphere with carbon dioxide and carbon monoxide. Although carbon monoxide does not act as a greenhouse gas, it is poisonous to breathe. Gumdrop model of a carbon dioxide molecule, CO2 . It has one carbon atom and two oxygen atoms all bonded together. Gumdrop model of a carbon monoxide molecule, CO. It has one carbon atom and one oxygen atom bonded together. Our livestock (cows, pigs, and chickens, for example) also pollute the atmosphere with methane from their digestion process. Gumdrop model of a methane molecule, CH4. It has one carbon atom and four hydrogen atoms all bonded together. Ozone is made when the Sun cooks carbon monoxide, such as from our car and truck exhaust, with other chemicals in the atmosphere. Gumdrop model of ozone molecule, O3 . It has three oxygen atoms bonded together. In the case of ozone, it's all about location, location, location. Drawing shows four different levels of ozone in the atmosphere. At top of stratosphere, 30 miles high, ozone absorbs most of the harmful ultraviolet radiation from the Sun. At the top of the troposphere, 12 miles high, ozone acts as a greenhouse gas, trapping heat. In the middle of the tropsohere, ozone helps clean up certain pollutants. At the bottom of the troposphere, at Earth's surface, ozone makes smog. Ultraviolet radiation from the Sun causes sunburns and skin cancer. Ozone high in the stratosphere shields us from much of this ultraviolet radiation. But at the top of the troposphere, ozone acts as a greenhouse gas and adds to global warming. 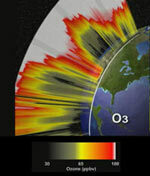 In the middle region of the troposphere, ozone helps to clean the atmosphere of certain pollutants. But in the atmosphere close to Earth's surface where we live, ozone adds to smog and is hard on plants and animals, including us. So, it is not enough to know how much ozone is in the air. We need to know where it is. That's one reason NASA has developed the Tropospheric Emission Spectrometer, or TES. 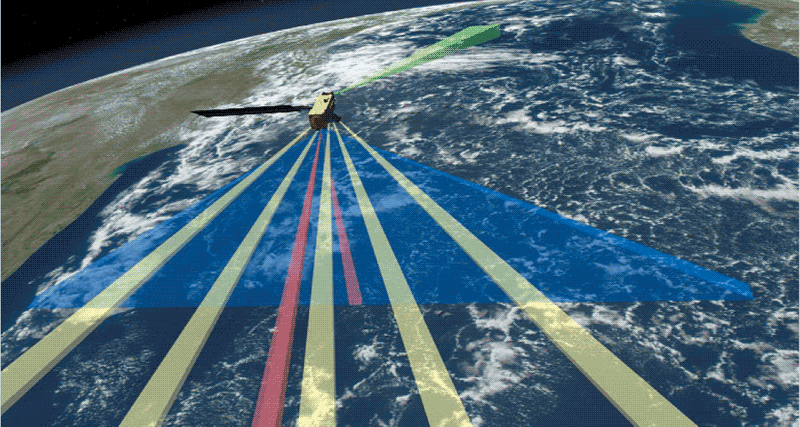 TES is one of four instruments studying the atmosphere from an Earth-orbiting satellite called Aura. From high above Earth's surface, TES looks down through the atmosphere and measures how much ozone is at different altitudes. This information is called an ozone profile—like slicing through the atmosphere and seeing it from the side. As Aura's polar orbit takes it over the North and South Poles, Earth rotates beneath. After 16 days of orbits, TES has measured ozone over the whole planet. Then it starts over. The movie clip below shows the ozone measurements after computers have processed them into images. The reddest areas have the highest concentrations of ozone. In some places that red area is high in the stratosphere where it shows "good ozone," but in other places (such over large cities), the red areas drop to very close to the ground, showing "bad ozone." This movie is a moving "curtain plot" of ozone levels. It is made from TES ozone data. It shows concentrations of ozone at different altitudes in the atmosphere over North America the first week in November 2004. White areas show the highest concentrations (the most ozone). Red shows the next highest, then yellow, green, and black, which shows lowest concentrations. Notice how the red area dips down close to the ground in some locations. These are smoggy cities. Now that you understand ozone, and how it is good or bad depending on where it is in the atmosphere, you are ready to play Ozone Trap-n-Zap!